Growing up, family dinners were a big deal for us. While Mom and Dad cooked, it was the kids’ job to set the table and make sure all the glasses were filled. Nobody was allowed to start eating until everybody had sat down at the table and nobody was allowed to get up until everyone else had cleared their plate. Elbows, books, CD players, and answering the phone were all strictly prohibited from the table—to talk and eat was all we were there for. It was a time for bonding and catching up around the table. That square-legged white oak glossy table, built for six but with leaves for 12 if you gave up a little elbow room during the holidays, put up with a lot over the years. Spilled coffee and juice, scrapes and chips, being clawed by the dog—in all its decades of use it never lost its sheen. My parents still have it, and you’d think it was built for a king the way it still holds court in the dining room. I can’t imagine their house without that table, and that’s exactly the kind of lasting impact that a beautiful, solid piece of furniture can have for a lifetime in the family home. With this in mind, here are few tips for picking out the perfect dining room set for your own Dallas home. 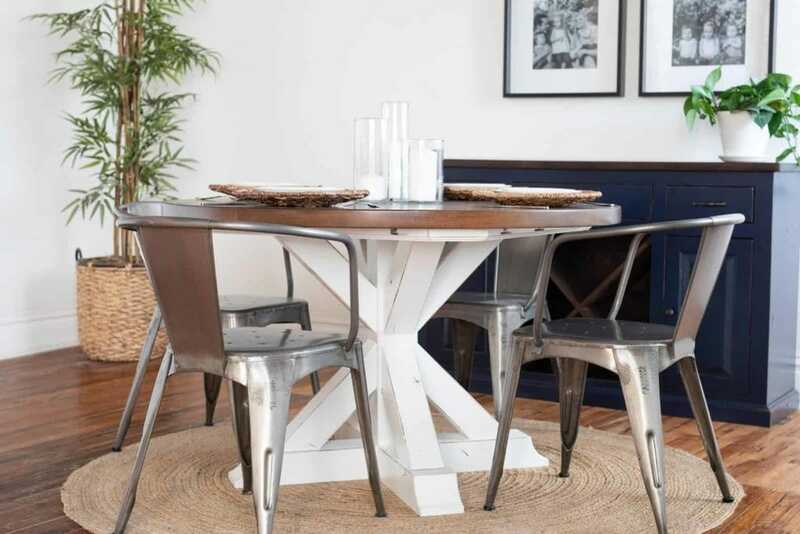 Choosing a dining room set comes down to two main considerations: function and style. The table needs to fit well in your space, seat everyone you want to sit, and stand up to the daily wear and tear of family life. That’s function. Once you’ve established your needs in this area, you can turn your attention to style. The table should complement and enhance the space it’s in. While it doesn’t need to mirror the other colors and materials in your dining room exactly, a good table centers the room’s conversation. It will likely be the largest piece of furniture in the room, and the one you gather around. So, it should speak in the same tone as the rest of the room—light and airy in bright, open rooms, or dark and solid in cozy winter dens. It should be a piece that draws you to it and makes you want to use it. Just remember that you don’t have to sacrifice function or style, especially if you are considering custom furniture that can be made exactly to your specifications. 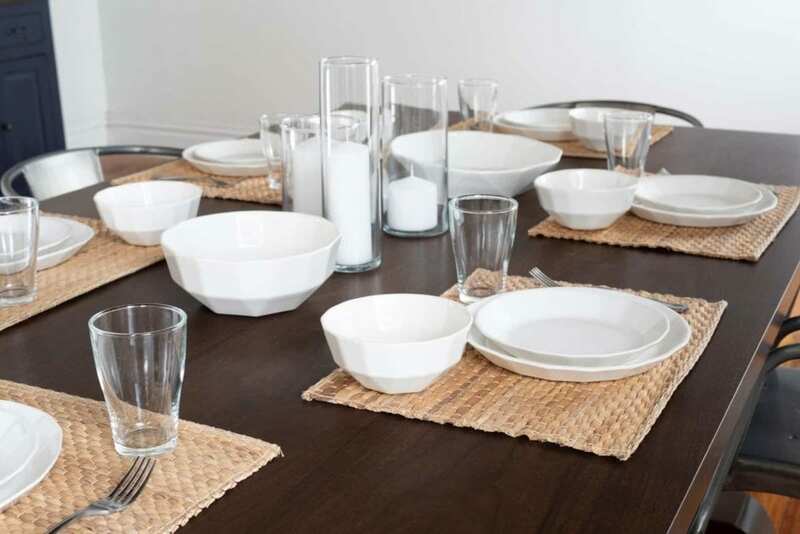 After you’ve thought through some of the fundamental requirements that you have for your new dining room set, you can move on to some of the finer details, like correct sizing. A dining room set needs to fit in the dining room, and fit your family around it. In addition to the table itself, you’ll also need space for chairs and aisles for movement around each side. To see how large your table should be, measure your dining room inwards from the walls, and any protruding furniture. Subtract at least three feet from each side for seats and movement. The length and width you have remaining will be the largest possible table you can fit. Once you know the size of the room, you can shop for tables which meet or are smaller than those dimensions. You can also have furniture custom-built to fit your room, which guarantees the table will be the perfect size. You can either take your measurements in to a furniture maker or you can schedule a visit from a consultant who’ll come to your home to size it professionally. Typically, dining rooms are square or rectangular. Dining room tables are correspondingly square or rectangular, and can have straight or rounded edges. Square tables fit square rooms; rectangular tables fit rectangular rooms. Rectangular tables can accommodate extra seats more easily, especially with an expanding fly. Round tables create more walking space, and can fit more people around the edges. You’ll need room for at least as many seats as you have family members. If you have more space, you can consider a larger, or expanding, table to create room for hosting friends or family. If you’ve just purchased a new home, or finished a renovation, you may not already have seats for your table. In this case, you’ll likely be able to find a matching set of chairs to go with your table. When you’re looking at the table in the showroom, be sure to check that the seats tuck mostly into the table, to preserve space. Try sitting in them, too, to see if your legs have room underneath. If you’re replacing an older table, but still like the chairs, you can keep them. Combinations of furniture from different sets contribute to the character of a home. However, if the old chairs don’t fit the new table, you’ll probably be looking to buy new ones. If that’s the case, you can choose a matching set, or find another set of chairs that catches your eye. If you’re shopping for new chairs, you can also consider a bench. The humble-yet-worthy bench can be a chair for two, or even three, and is ideal for families with kids. The bench has a democratic effect, seating siblings on the same equal plane, instead of sequestering them in high-backed chairs. When the kids grow up and go to college, and your table seats fewer, the bench can begin a second life as a home for pictures, books, and plants. Now that the functional aspects of dining room sets are addressed, we can sit down to what’s important: taste. The dining room table, in combination with the rest of the room, sets the mood for family dinners. Tables can be made from many materials, including wood, stone, glass, and metal. Glass and metal can be striking and durable, but can suffer from damage and proudly display fingerprints. Wood matches most rooms, has high durability, and is comparatively lighter and less expensive than stone. Wooden tables come in wide variety. Generally, hardwoods, like oak or alder, are more durable than softwoods, like pine. When picking out a table, look for a wood color and stain that will go well with your walls and floor. While blonder hues can brighten a room, reddish and brown hues can lend an impression of warmth. Dining room tables bring the family together. To find the right one, remember size, seats, style. Check chairs and benches for leg room, and ask about delivery and the store’s warranty. Soon enough, you’ll be sitting around your perfect table with your family and friends, sharing meals and memories. At Unruh Furniture, we believe in the centrality of good furniture. We hand build our custom dining room tables and chairs to the highest standards of quality, and guarantee them for life. 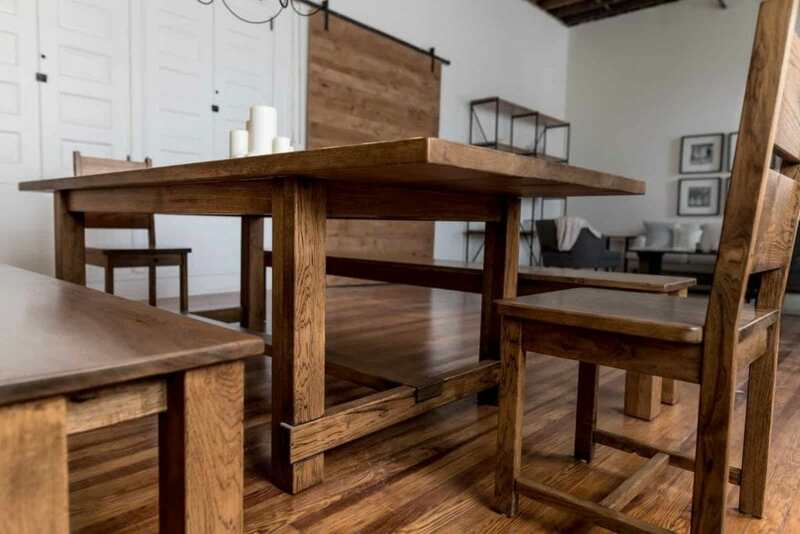 Schedule a visit to our Dallas showroom to find the perfect table for your family. Image 1: A dining room set in a dark finish can bring extra warmth to your dining space. Image 2: A versatile, round Yorkshire table can fit into a variety of spaces. Image 3: Consider pairing your Farmhouse Table with a bench for extra seating versatility.